Our disc anchor system uses stainless steel pins bolted through pre cut holes in the frameless or semi frameless glass panels. The glass is extended below ground or decking level before being fixed in place by the bolts. The 'face fixed' nature of an anchor disc system means that when seated on your balcony, the hardware is totally invisible. Combined with our Sentry Glass, you have a true frameless glass effect and keep those views totally unobscured. We have been measuring designing and installing point fixed balustrades for over two decades. We know the traps, potential issues to watch for. We dont cut corners.. and we know all the rules! Our premium 316 grade heavy duty hardware is designed to the highest engineering standard. When installed by our experienced team of tradies, you're looking at a balustrade build worthy of the best homes in Auckland. Solid extruded 316 grade stainless provides the best outcome for structural integrity and a long service life. Our range of anchors includes square, round (50mm and 100mm diameter) and even rectangular options. Handrail and brackets are co-ordinated to suit the style of the anchors. We glaze our high quality, premium balustrades in strict accordance to NZ housing regulations. With new laws coming into effect in 2017, we have a range of options that not only comply, but still have the high class 'frameless' glass appearance. Interlinking rail systems allow for toughened safety glass to be used as the glass is not required to hold itself together in the unlikely event of a breakage. 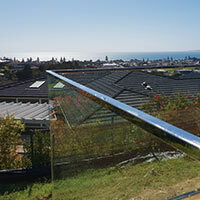 The 'rail' is connected to each pane of glass and also to the building and provides the safety barrier to a fall. A top edge rail capping (or handrail) will protect the edge of the glass but in the event of glass breaking, toughened safety glass will fracture into small safe fragments. Contact us for more information and pricing on our balustrade systems. If the glass breaks, glass fragments remain held in place with clips, firmly bonded to the interlayer. This system is made with 13.2mm Toughened Laminated Safety Glass (EVA interlayer). In the event of the glass breaking, the fragments of glass stay bonded to the interlayer. The glass in an EVA system retains its clarity after years of exposure. It is extremely durable and resistant to clouding. 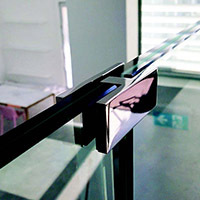 A handrail, continuous top edge rail or interlinking glass clamps is generally combined with an EVA system. The interlinking clamps or capping will prevent glass collapse in the unlikely case of dual pane fracture. Highly resistance to collapse, the rigid interlayer keeps the glass erect even in the unlikely event of glass breakage. Toughened Laminated Safety Glass with SentryGlass structural interlayer. SentryGlass interlayers are five times stronger and up to 100 times stiffer than other conventional interlayers. This interlayer stays together and erect even when both panes of glass have been broken. If the glass ever breaks, fragments remain firmly bonded to the sentry glass interlayer, eliminating glass falling to the ground or over the edge. The glass retains its clarity, is extremely durable and resistant to clouding. No additional edge clamps or interlinking rails are required with this system.